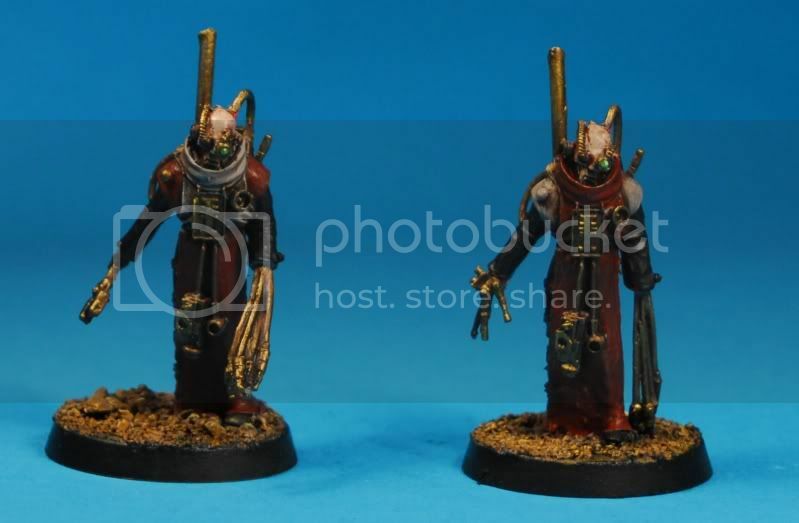 If anyone asked me for fluff however I probarbly wouldnt describe them as twins, let's say these two servitor-sages were a gift to our lord =][= for services rendered to the Adeptus Mechanicus. anyway they've got paint on. I was going to do a few more things to them, but something in my brain said "stop" and I usually listen to me. I think they look good as they are. Not quite dupes, but the colors tie them together nicely. Those are absolutely beautiful. I really like the black/red/white scheme that you went with - Keep up the great work! Well done, Karitas. What really struck me was how you painted the festering skin on the head where the cables are plugged into; aces. I would've voted for contrast, but hey, this does very nicely. 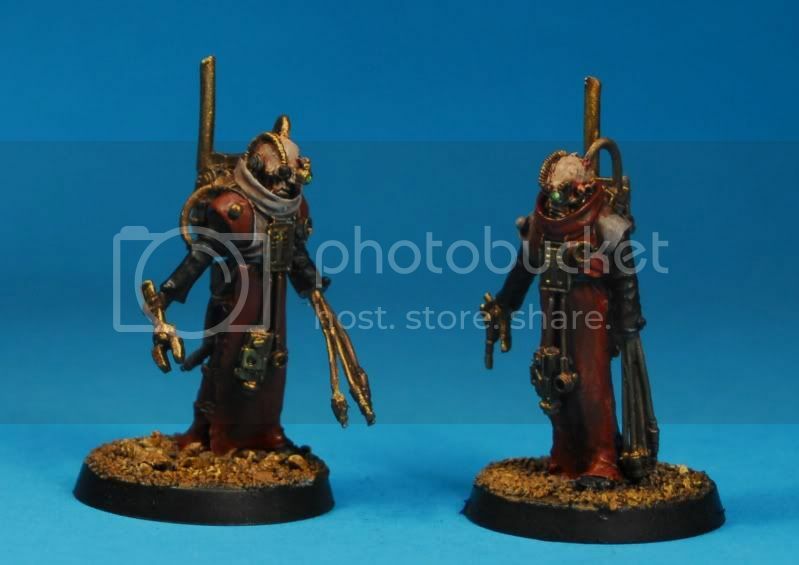 It was well worth the wait to finally see the Elite Inquisitor painted up; I especially like the metallic finish on the armour & the charring on the incinerator muzzles. Again, the face is very striking. 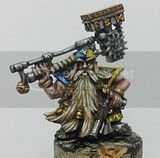 Well, as the saying goes, we usually are our own harshest critics but all in all, it's always heartening to see so many painted models. Chug on. 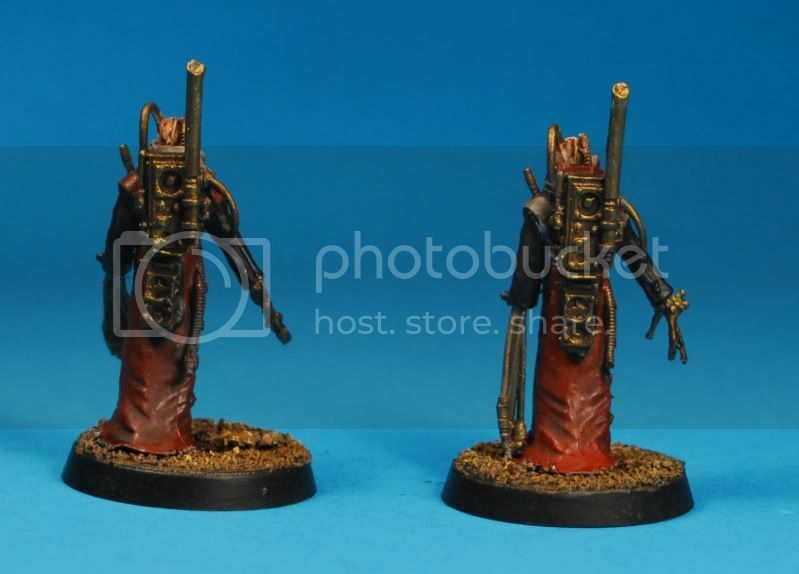 Thankyou all for the coments on the servitors, originally i basecoated 1 set of robes red and the other grey but the grey guy just didnt pop as much, he looked like a poor cousin so i went for the above "similar" approach. I counted today and i've painted 11 models of this army, with 38 to go, and 5 transports. at the rate of work, I reckon Its going to be another six weeks at current pace. I do however have a holiday coming up. but i've also started planning a large cityfight board. hrm. The detailing & tones on these are brilliant. I hope one day I will be able to paint glowing bionic eyes spot-on like that!